Windlass BOP Control Systems meet or exceed the most stringent quality standards including American Petroleum Institute specifications API 16D, RP16E & RP53 to assure safe and reliable operation under critical conditions. We provide BOP Control Systems for both onshore and offshore applications worldwide. Our BOP Control Systems are custom designed and manufactured to meet customers’ requirements and certifications. Our Design department is well equipped with the best tools and software for designing these units and each unit undergoes extensive tests and checks before dispatch to ensure trouble free operation to minimize rig shutdown time and ensure greater safety for the drilling crew. We can also upgrade and refurbish an obsolete unit as per API 16D or any other similarly recognized standard. All of which are supported by the Windlass field service network of engineers and technicians with extensive knowledge of electrical, hydraulic and pneumatic systems. Windlass BOP Control Systems are highly customizable. The following sections describe some of the options available on each subassembly. You can always contact us with your requirements and we can design the entire system for you. 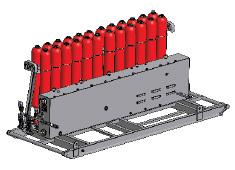 The Accumulator Module consists of a welded structural steel skid assembly with a fluid reservoir, provisions for mounting the electric pump, air pump system, hydraulic control manifold, interface module and the type and quantity of accumulators. The Electric Motor Driven Pump Module is the primary source for generating hydraulic energy which is stored in the accumulators to operate the BOP stack. These pumps are offered in a variety of options and operating voltages to meet customer requirements. Air Operated Pump Module is the secondary source used to provide high pressure fluid energy to charge the accumulator and operate the BOP stack functions. The Interface Module is mounted on the BOP Control System and provides remote control capability of hydraulic control manifold functions. The W-series Workover BOP Control Systems manufactured by Windlass combine the most advanced technology and quality components with a realistic approach to solving the application and space limitations encountered in today’s highly mobile workover environment. We produce a wide variety of Workover Control Units to meet the requirements for large workover rigs down to the smallest truck mounted rig. Each system consists of an accumulator module, high pressure pump and hydraulic control manifold.